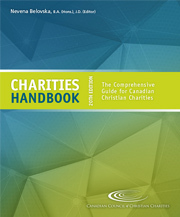 This free download is a sample chapter from CCCC's Charities Handbook, a comprehensive, authoritative reference tool to help charity boards and staff navigate complex legal and accounting issues. Published every two years, the full version of the book is free for CCCC members. Joining our mailing list gives you the opportunity to receive updates on charity news, CCCC events, and new resources. We respect your privacy and inbox capacity. You can unsubscribe at any time from the link at the bottom of our emails. "I have found our CCCC membership to be great value because of the help available by simply lifting the phone, and because of the ways you keep the issues in front of us."